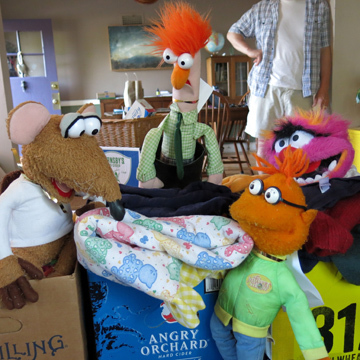 We are kind of like the family of Muppets I tried to sell....and everyone objected. We like each other no matter how weird or adorable we might be.Some fought for the new library in the toy room to include Muppets and so it goes. It was a family garage sale on a Friday, Everyone had plans for every Saturday on the calendar. So Friday it was. Tomorrow it might rain...hard. We didn't sell much. But we had some fun.Cousins love cousins. That is good enough.